WHEN Canadian punk fan PAUL McKENZIE decided to form a band in 1992, he looked to his Scottish roots for inspiration. The result is THE REAL McKENZIES, a band which could possibly lay claim to being the world's only traditional Scottish punk band. ``As a lad, my parents and grandparents would dress me up in a kilt and make me sing and dance to traditional Scottish music,'' McKenzie said. ``Starting a Scottish punk band is my way of getting revenge.'' 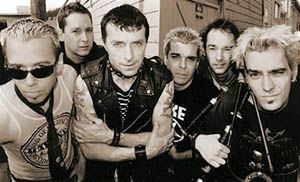 Dressing in full Highland regalia including kilts, high stockings and sporrans, The Real McKenzies have toured the US and Europe six times and supported the likes of RANCID, SHANE MACGOWAN and NOFX . The six-piece outfit, with bagpipe player MATT MCNASTY, arrived last week for its first Australian tour. The tour coincides with the release of the band's fourth album Oot and Aboot , its second studio album following the breakthrough Lochd and Loaded . With song titles including Nessie, Wild Cattieyote, Gi Us a Dram, Scots round the World and Pickled, the band promises to provide an entertaining show. Catch the band at the CAMBRIDGE HOTEL on Saturday night.